When I used to look at pleats, I'm sorry to say that I used to think of my grandmother's church skirts. Not sure that I would have ever considered myself actually wearing them. I do not own many pleated items, an Ann Taylor skirt that I never wear (but should pull back out again given fashion's recent tend back towards them) and a Marc by Marc Jacobs dress in brown and burnt orange colors with gold buttons and a burnt orange dress (sadly, gone by the wayside some time ago - a favorite of mine). Here are my recent spies, for my budget and the not-so-much-my-budget. I am a fan of all of these styles. Now this dress, I love and think would look good on my body type. Plus the color! Wow! And more for my budget. While I love this dress, I'm not sure I could pull this style off. Again, another Hannah dress in my opinion. I like the slit in the sleeves. This is my favorite of the dresses. I would wear this dress until it absolutely wore out. Love it! The colors, the style and fit, everything. Love it. While I love long skirts, I rarely purchase them. I'm short and it looks funny. I have a couple maxi dresses however, I don't wear them often for the same reason. If I were taller, most definitely. Isn't this Tibi skirt gorgeous! I love the bold print in the pastel colors. for a more casual look. And it's on sale! A steal at $19.95 when it was once $138! 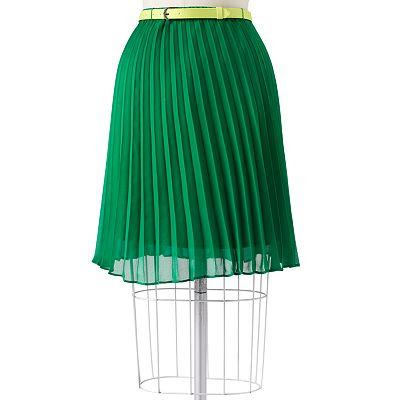 I love the color of this skirt, reminds me of spring, especially with the lime green belt. 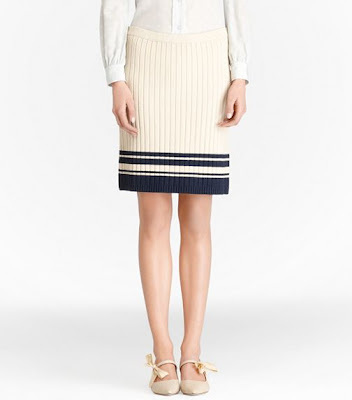 Perfect for the office with cream and navy being very classy and preppy colors. Again for the budget conscious who want a fabulous designer look, this skirt is from the Jason Wu for Target collection and is now on sale! Last but not least, my favorite (of course, given the price!). 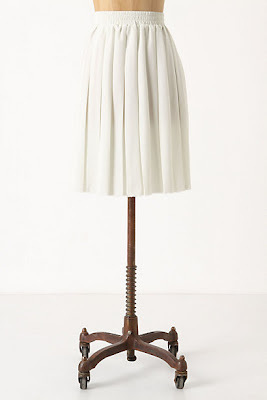 This reminds me of the skirt on my pleated Marc by Marc Jacobs dress, same length and style. A comfortable flow and classic fit with a little modern flair from the single black stripe. 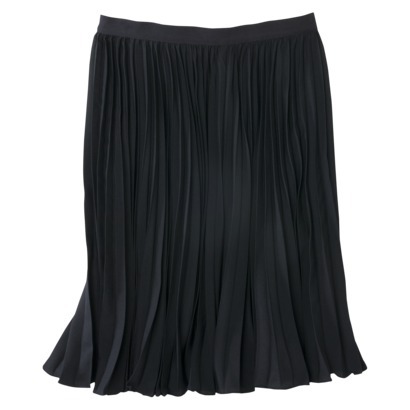 What do you think of the pleated styles? Yay or Nay and which is your favorite style? Me too! I only wish I could find something similar in a brighter color...that particular color would wash me out something fierce, but I love the style! I definatly can't get away with the long skirts. I love them, just can't wear them. You know me all too well, I simply adore that top dress!! I've gotten a beautiful long, pleated, pink skirt to wear but haven't yet. 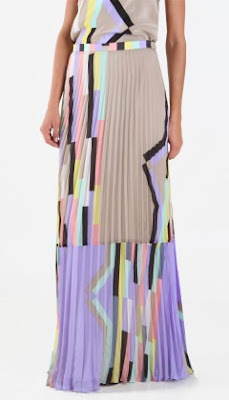 The BCBG maxi is beautiful and the one from Kohl's is the perfect green. I like all of your picks! I love pleats, but just can't pull them off. Your dress choices are spectacular. Lilly On Rue La La Right Now! Melly M. and Skirtin' Around on RUE LA LA! Lilly on Rue La La!